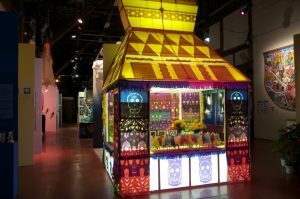 Elena-María Bey, a Bahá’í artist, will be included among the artists shown at SOMArts Cultural Center in honor of Día de los Muertos. SOMArts’ 17th annual Día de los Muertos exhibition will open on Friday, October 7, 2016 with a public reception from 6:00–9:00 pm, and will run through Saturday, November 5. This year’s theme is: A Promise Not to Forget, which is meant to shine a light on issues of violence, including in reference to the United Nations Day for the Elimination of Violence Against Women. This theme is also a call to respond to recent incidents of violence — from Orlando to Baton Rouge and Minneapolis. it is meant to honor people who have unnecessarily lost their lives and to look towards the future we want to make for ourselves.